Two major problems I’ve seen in most impoverished countries are insufficient construction and severe environmental concerns. Guatemala, my home for four of the last seven years, is no stranger to these issues. But, that’s not to say no one cares. Not only does Guatemala contend with massive litter problems, chemical runoff in its lakes, and no organized recycling system, but Guatemala City also houses Central America’s largest landfill. To compound the problem, an entire community survives by finding recyclables in the dump, living on food waste, and building homes out of unsanitary materials. Even away from the landfill, many homes and public buildings, like schools, are a mishmash of scavenged cinder blocks and scraps of tin. My second year living here was spent volunteering for an NGO, Las Manos de Christine, that assists a small public school in the village of El Hato, only a few miles outside of Antigua, the country’s pristine tourism capital. It was in trying to build a new English classroom in El Hato that I became aware of some of the awesome ecological building projects happening here. Amongst the world’s top environmental trouble-causers is plastic, particularly the abundance of daily items like bottles, bags, and wrappers. Hug It Forward has championed a creative way of combating this problem and, at the same time, helping communities build safe facilities for their children: “Bottle schools”. 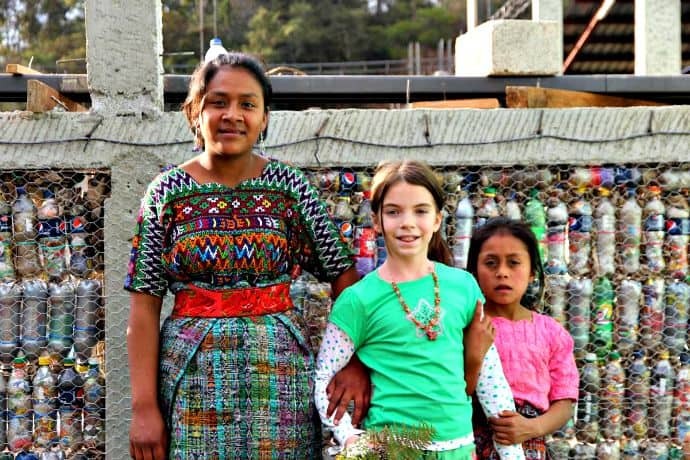 Bottle schools are constructed from bottle bricks, building blocks formed by stuffing cleaned plastic bottles with other sanitized trash materials, like—aha!—bags and wrappers. Instead of just coming in and providing a new schoolhouse, Hug It Forward rallies communities, introducing them to a new eco building method and assisting with construction of a new school. 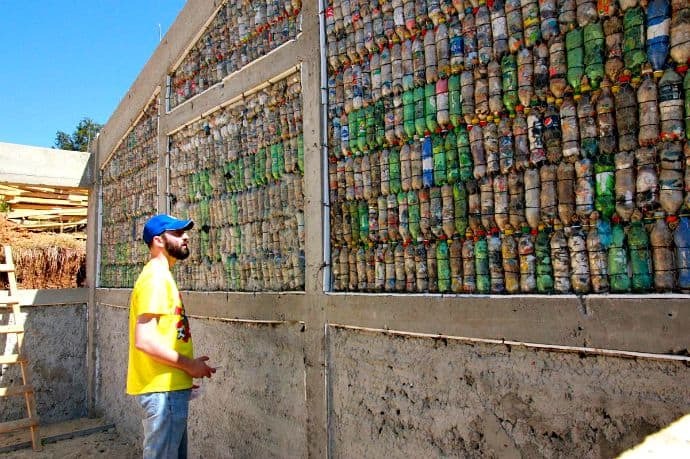 The residents of a village or town collects the materials, creates the bottle bricks, and builds the walls of their new school from garbage, empowering them with the ability to help themselves, their children, and their community. Earth Lodge is in the village of El Hato, where I worked my second year in Guatemala (and, at least in part, every subsequent one since). The owner/builder of the eco-lodge, Drew Shankman, has spent the last few years experimenting with earthbag construction, a method of building that uses soil on site to create large bricks. The earth dug out to create space for a structure is filtered into used or misprint feedbags and packed into a durable building material. It’s cheap, strong, and simple, so local workers have become earthbag experts. Nowadays, driving into the village, earthbag structures are everywhere. 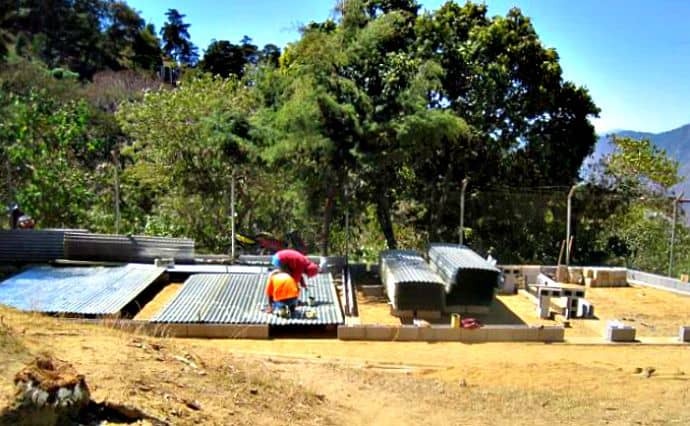 El Hato is located on the side of a mountain prone to mudslides, so earthbag construction has been instrumental in creating retaining walls and repairing damaged roads (of which there is only one in El Hato). 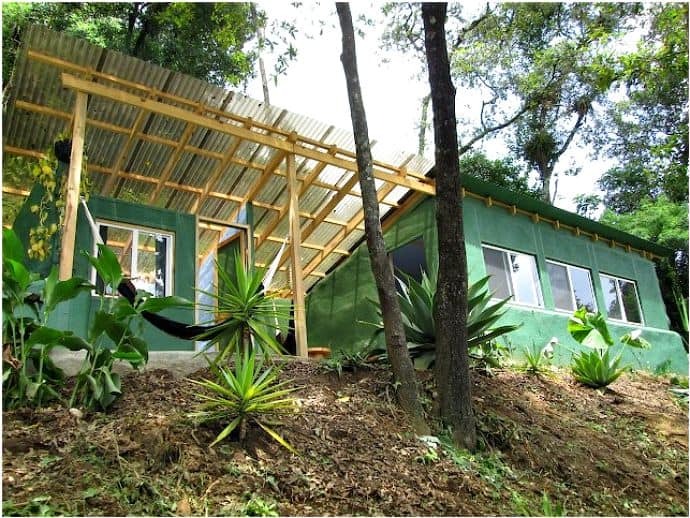 Via a small crew of laborers employed by Earth Lodge, the community has come to embrace and utilize this environmentally friendly building method. After clearing the space for El Hato’s English classroom, left with a massive pile of perfectly good dirt, Las Manos de Christine even hired Drew’s crew to put up a five-foot foundation wall for us. In the past, such a pile would have been left to become a big grassy pimple in the schoolyard. Another long-lasting, cumbersome item that makes it into the trash heap is tires. In a sprawling metropolis like Guatemala City, where I once witnessed hours of traffic back-ups every day, morning, lunch, and rush hour. Four tires per car, however many miles of hard, brake-stomping commuting—how many tires are discarded in a year? 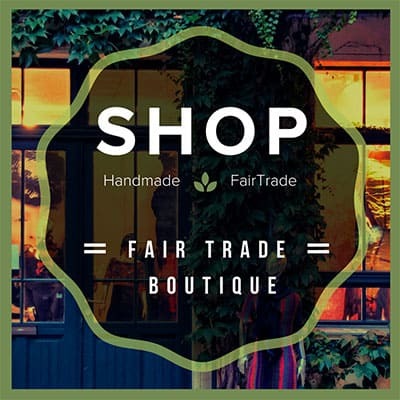 Very aware of the tire-trash dilemma, an NGO called Long Way Home teamed with an eco-construction outfit called Earthship Biotecture to start building tire houses. 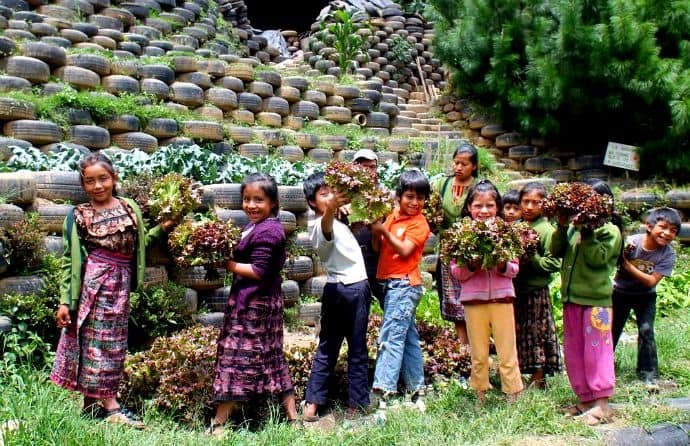 By strategically stacking and fixing discarded tires together then filling them with packed earth, strong walls go up, trash disappears into an attractive living space, and a family gets a nicer place to stay. 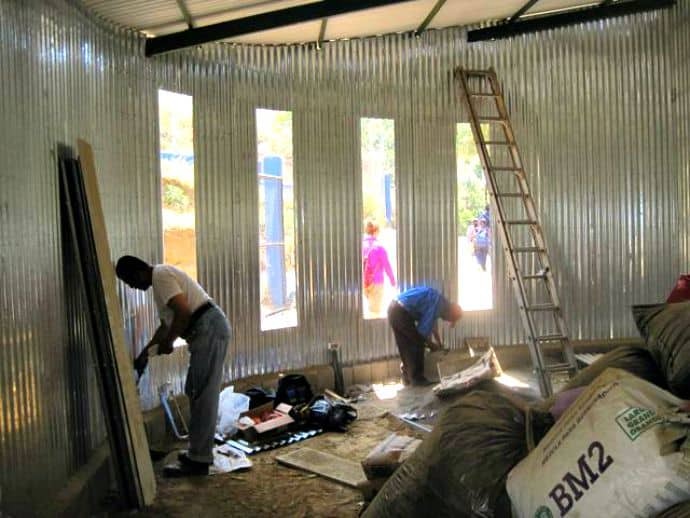 Again, by involving volunteers and members of the community, people are empowered to do for themselves, and knowledge spreads, creating the potential for more architecturally sound homes and buildings with less garbage stinking things up. Ultimately, Las Manos did get the classroom built. 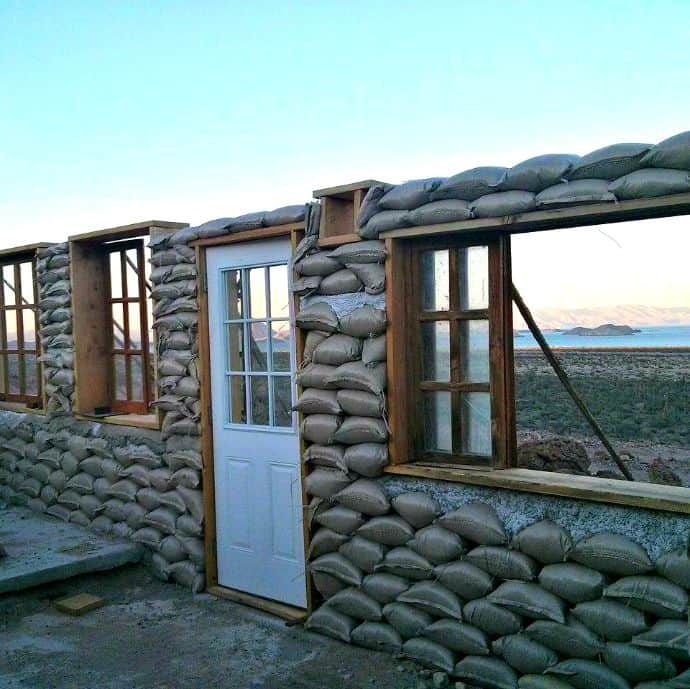 Besides the earthbag wall, our project was headed up by a local developer, Pablo Swayze. Swayze invented a technique using lamina (sheets of corrugated tin), which takes a familiar and inexpensive building material in Guatemala and amps it up into something structurally secure and aesthetically pleasing. By riveting two sheets of lamina together, Swayze’s method creates stronger, insulated walls and using clear plastic on the ceiling provides natural lighting. While true that lamina construction uses resources, it’s light design allows builders to utilize available foundations—the concrete supporting of a fence, the earthbag half-wall, and a part of stairwell in El Hato’s case—to erect the walls. This cuts down on material and costs, and regardless, the method uses much less material than typical cinderblock buildings. 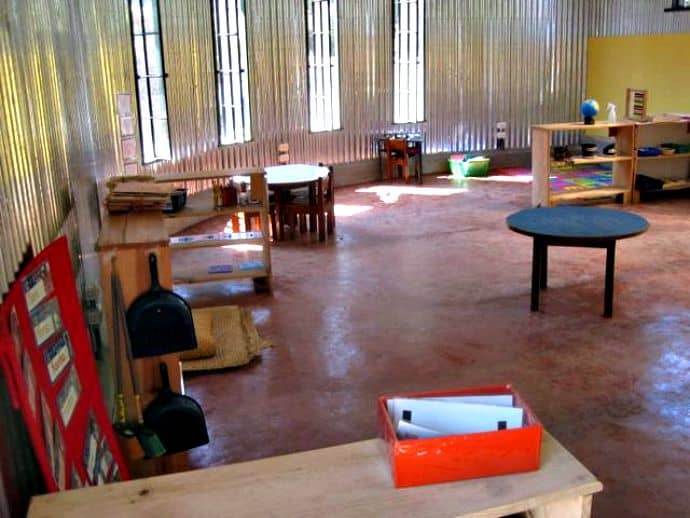 Swayze’s design was less than half the price of other options available to us, and the work was so convincing, Las Manos hired him two years later to build a preschool. Swayze has worked with other communities to construct public buildings and homes, and in an effort to keep lamina construction affordable, he patented the technique so that it remains accessible to those who need it. A couple of years ago, he passed away, but his stable buildings and methodology live on as a testament to him. It’s amazing the solutions that can arise out of need. These four examples are just a sampling, projects I was fortunate enough to be exposed to, of what’s happening in Guatemala and elsewhere. Hug It Forward and Long Way Home offer volunteering opportunities to participate in their upcycling construction, Drew at Earth Lodge often does work-trades with interested traveling builders, or for those who are all-thumbs, Las Manos de Christine welcomes volunteers to help with their educational causes. 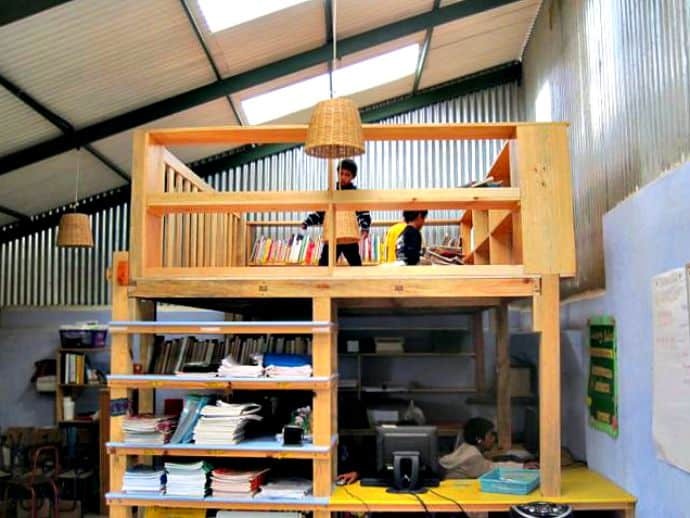 Whichever way, like me, volunteers are sure to be introduced to some inspiring projects. Upon returning to Guatemala earlier this year, I learned of a new eco-block technique in which clay, sand, and lime (roughly five percent of the mixture) are pressed together to create a material more ecologically sound than concrete bricks yet still marketable. 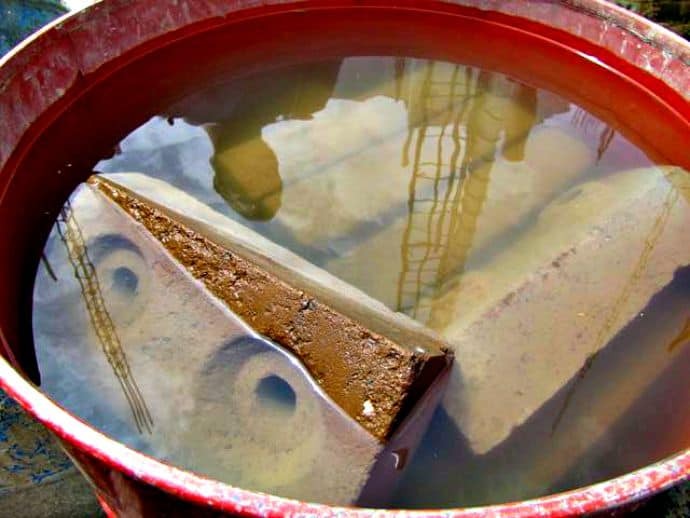 Because of the lime, the blocks hold form even when submerged in water, and they seriously decrease the amount of concrete in typical Guatemalan, or worldwide, construction. Though relatively new, inter-blocks are causing some excitement in the expat community. 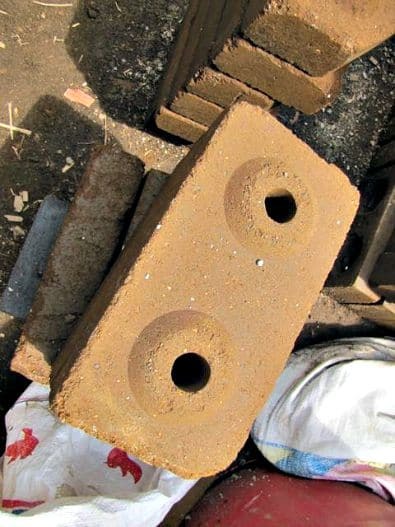 Company owner Elias Fischer claims that these bricks, with a slight variation to what is known as compressed earth blocks in the US, can withstand Guatemala’s frequent earthquakes and the humidity of a six-month wet season. The bricks are molded with two conical protrusions on the top and two matching impressions on the bottom, such that they work almost like gigantic, eco-friendly legos, interlinking to create strong structures.